Anne Marbury Hutchinson was a Puritan, who held discussions in her home in the Massachusetts Bay Colony, critiquing the Bible and Puritan laws. These sessions, which were in opposition to society’s religious codes and inappropriate for a woman to engage in, eventually led to Hutchinson’s exile from the colony. She represents the many women in history who have suffered social punishment for intellectual pursuits perceived as threatening, particularly related to religion. Hutchinson was born in England to clergyman Francis Marbury and his wife Bridget Dryden. She married William Hutchinson, a local merchant who would later become a judge in the Massachusetts Bay Colony. The Hutchinsons followed the teachings of Puritanism, a religious ideology born out of English Protestantism that taught the supreme authority of God over all human affairs, as dictated in the Bible. They were particularly interested in Reverend John Cotton, an early outspoken Puritan leader, who sought reform of the English church and its teachings. In 1634, the Hutchinsons immigrated to America in part to escape taxes forced on them by the English monarchy, a move that Cotton had already made the year before. The Massachusetts Bay Colony was an English settlement composed mostly of Puritans. It was started around 1629, near the present-day cities of Salem and Boston. Living in the Massachusetts Bay Colony, Hutchinson began to hold Bible study classes in her home; at first they consisted of only women who gathered to discuss the Bible’s literal meaning. Eventually, the group expanded their focus and began discussing and critiquing teachings from the pulpit, most notably the authoritarian idea that one could only reach God through the clergy and not through a personal relationship separate from the church. They also criticized the extant social and political systems of Puritanism and the colony, including the assumption that women were inferior to men under God’s laws. The Puritans identified these discussions as heretical, particular as they were conducted by women. In a society where all communication with God was conducted through and interpreted by officials of the church, a questioning of these spiritual relationships was a seen as a direct attack. News of these groups spread and attendance at the Hutchinson home swelled to around eighty persons per session, including both women and men. Because of the popularity of these meetings, Hutchinson developed both allies and enemies within the colony. Amidst political and religious battles, she was deemed a threat and put on trial for her heretical views and actions by John Winthrop, who had won governorship of the colony in 1637. She was found guilty of lewd conduct and blasphemy and banished from the Massachusetts Bay Colony in March of that same year. Following banishment, Hutchinson, her family, and many of her followers, called Antinomians—members of a religion who feel that they are not under obligation to follow the rules and codes set out by religious authorities—moved to Rhode Island and then later to Long Island. In 1643, in their new home, a war between Dutch settlers and Native Americans broke out, and Hutchinson was killed, along with all but one of her children living with her at the time. Three hundred and fifty years after Hutchinson’s banishment, in the year 1987, she was officially pardoned by Michael Dukakis, governor of Massachusetts. Many of her genealogical descendants became well-known social and political figures, including three United States presidents: Franklin D. Roosevelt, George H. W. Bush, and George W. Bush. 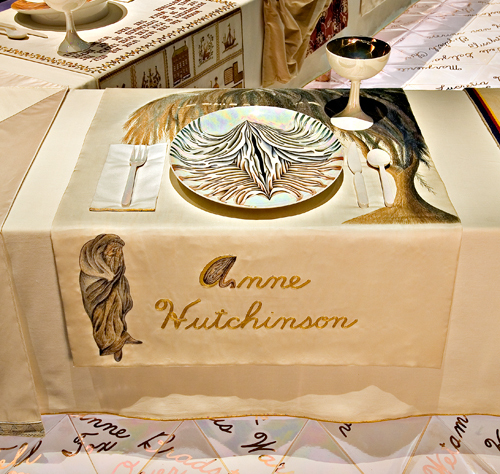 Anne Hutchinson’s place setting is based on eighteenth-century mourning pictures created by women. These pictures combined needlework and watercolor painting and portrayed grief over the loss of an important public figure, family member, or close friend. Production of these pictures began about 100 years after Hutchinson’s death and reached a climax in popularity following the death of George Washington in 1799. The iconography was typically grieving women, weeping willow trees, and Grecian urns on tombstone pedestals—images represented in Hutchinson’s plate and runner. Based on her research, Chicago began to feel that women held a better place in society prior to the Renaissance; she suggests that the seventeenth century was a particular low point in the history of women (Chicago, A Symbol of Our Heritage, 53-4). In Hutchinson, a religious woman banished from society by the church, Chicago saw a symbol of women’s diminishing power and so chose to base her place setting on the mourning picture. 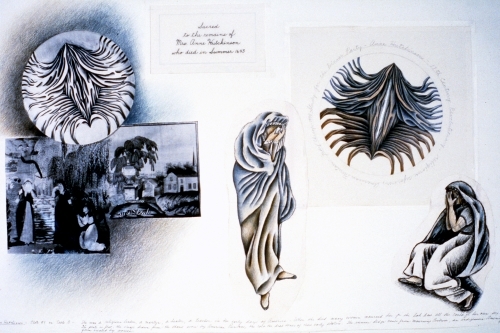 The image on Hutchinson’s plate represents both the type of shawl worn by a grieving woman, as well as a death shroud. 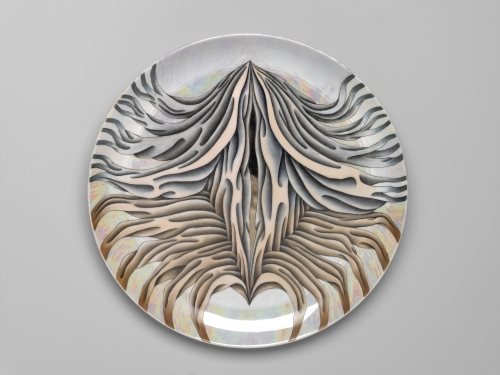 The plate and runner are both done in muted earth tones that convey the somber mood of grief. The runner was made with same techniques and materials as are in a traditional mourning picture, such as embroidery and silk fabric. The difference is in the scale; the runner is substantially larger. The lamenting woman, a common figure in traditional mourning pictures, as well as on Grecian urns, stands to the left of Hutchinson’s name. The embroidered image of the willow tree, whose branches hang over the plate, suggests the burial site; the roots of a willow absorb water from the ground to keep graves dry and protect the corpses. 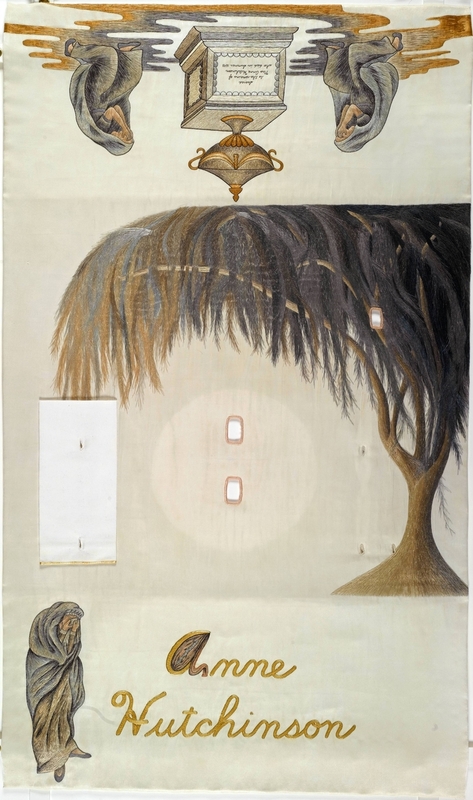 The imagery on the runner is embroidered with a downward stitch, especially evident in the lamenting woman and the leaves of the willow tree; Chicago chose this technique to emphasize the mood of sadness and loss. In the scene on the back of the runner, two women are depicted kneeling at the mortuary urn; it is another common image in mourning pictures. The urn itself has been historically identified not only as a vessel for the remains of the dead, but also as a container of the female spirit; it is a symbol of the aspect of the goddess associated with death, and a place for witches to practice their rites. Carnes, Mark C., and Michael P. Winship. The Trial of Anne Hutchinson: Liberty, Law, and Intolerance in Puritan New England. New York: Longman, 2004. Hall, David D., ed. The Antinomian Controversy 1636–1638: A Documentary History. 1968; 2nd ed., Durham: Duke University Press, 1990. Huber, Elaine C. Women and the Authority of Inspiration: A Reexamination of Two Prophetic Movements From a Contemporary Feminist Perspective. Lanham, Md. : University Press of America, 1985. Kamensky, Jane. Governing the Tongue: The Politics of Speech in Early New England. Oxford; New York: Oxford University Press, 1997. Lang, Amy Schrager. Prophetic Woman: Anne Hutchinson and the Problem of Dissent in the Literature of New England. Berkeley: University of California Press, 1987. LaPlante, Eve. American Jezebel: The Uncommon Life of Anne Hutchinson, the Woman who Defied the Puritans. San Francisco: Harper, 2004. Pagnattaro, Marisa Anne. In Defiance of the Law: From Anne Hutchinson to Toni Morrison. New York; Oxford: Peter Lang, 2001. Westerkamp, Marilyn J. Women and Religion in Early America, 1600–1850: The Puritan and Evangelical Traditions. London: Routledge, 1999. Williams, Selma R. Divine Rebel: The Life of Anne Marbury Hutchinson. New York: Holt, 1981. Winship, Michael P. Making Heretics: Militant Protestantism and Free Grace in Massachusetts, 1636–1641. Princeton: Princeton University Press, 2002. ——-. The Times and Trials of Anne Hutchinson: Puritans Divided. Lawrence: University Press of Kansas, 2005. Winthrop, John. A Short Story of the Rise, Reign and Ruin of the Antinomians, Familists and Libertines That Infected the Churches of New England. 1644; paperback reprints, Whitefish, Mont. : Kessinger Publications (in association with Amazon.com), 2003.